Clean up poop stains right away for best results. 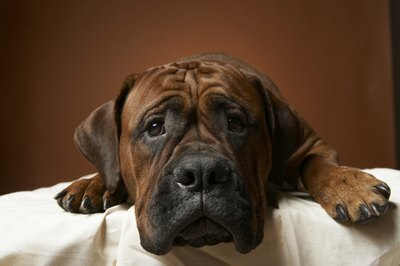 It's not uncommon to discover an unwelcome present on your floors or furnishings if your pooch is sick or has been inside too long. If your pal poops inside, don't punish him, and don't wait to clean it. The sooner you clean poop stains, the easier they are to remove. Remove as much solid dog poop as possible by picking it up with a gloved hand or a plastic bag if it is relatively solid, or scraping it up with a paint scraper or other tool if it's toward the soft side. If there is little solid material, use paper towels. You can seal it in a zip-seal bag or tie off a common plastic grocery bag. Spray the dog poop stain with a pre-wash stain remover solution. Allow it to soak for about 10 minutes or for the length of time stated on the bottle. Pre-wash stain removers are available in the laundry aisle of most retailers. Scrub the stained area with a soft-bristle scrub brush and a mixture of warm water and liquid dish detergent. Place an absorbent cloth over the stain and allow it to pull up moisture from the carpet or fabric. Replace the cloth with a dry one as needed until the carpet is mostly dry. Repeat spraying and scrubbing the spot until the stain is no longer visible. Depending on how long the poop was on your carpet before cleaning, this process may take minutes or hours. Soak up as much moisture as possible using clean towels or paper towels. Remove lingering odor by treating the area with equal parts white vinegar and water. Wet the area but do not soak it. Blot the liquid with clean towels. Sprinkle baking soda over the area and allow it to dry overnight. Vacuum when completely dry. Check upholstery tags for colorfastness before using, and test any stain remover you purchase on an inconspicuous spot before using it to clean poop stains.